Release of the orbit type Yamaha SCARA robot YK500TW - News Releases | Yamaha Motor Co., Ltd.
Yamaha Motor Co., Ltd. has developed the new Yamaha "YK500TW" orbit type SCARA robot (multiple horizontal joint-type), featuring a ceiling-mount (overhead installation) type. This model will be released for sale on December 1, 2012. Being a ceiling-mount type, the secondary arm of YK500TW is positioned below the primary arm, thus widely expanding its working area. Furthermore, the unique structure makes it possible for optimum movement of the arm between work points, enabling a greatly reduced cycle time (Cycle time: 0.29 sec., 36%faster than the current Yamaha model). The ceiling-mount structure also allows for greater freedom of system design by making it possible to position robots in places where other types of robots could not be positioned, thus enabling more efficient use of facility space. YK500TW inherits the qualities of high-speed, precision and durability that Yamaha SCARA robots are known for and expands the customer's options to help achieve optimum manufacturing facility layout and system set-up. In this way, it is expected to expand the SCARA robot market. Yamaha orbit type SCARA robot "YK500TW"
Product name Yamaha orbit type SCARA robot "YK500TW"
The recent spread of hand-held electric/electronic devices such as smartphones and tablets and increased demand for small electronic components for automobiles has led to a rapid rise in demand for greater production efficiency and consistent quality in manufacturing operations, particularly at manufacturing bases in Asia. The new YK500TW has been developed to offer all of the inherent advantages of a SCARA robot while adding faster cycle time and a larger range of motion that make new applications possible. These features make possible a wide range of applications for the assembly movement and transport of electric/electronic parts and components required for high-precision assembly work. The operating surface area has been increased by approximately 120% compared to the current Yamaha 500 mm arm model. There is no dead space in the center of the functional motion range, enabling a cylindrical range of motion of φ1,000 mm×130 mm. The small overall height of the robot unit at 392 mm increases freedom of system layout. As with the current Yamaha SCARA robots, this model enables applications for high-accuracy assembly of super-small parts as well as sustained positioning accuracy at a high level over long periods of operation. A maximum transportable mass of 4.0 kg and the R-axis tolerable moment of inertia at 0.05 kgm2 makes it possible to attach all types of tools including vacuum devices. 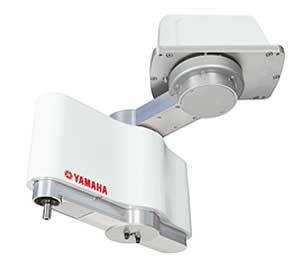 As with other Yamaha robots, the positioning detector (sensor) is a resolver type. It has a robust construction and compared to an optical type encoder, it has much greater environmental adaptability and lower incidence of malfunction. · This model is equipped with an absolute position transducer (sensor) that helps minimize time loss at the start of operations. · The robot is fitted with 8 user wires and φ4×2 tubing/piping as standard equipment to enable optimal layouts of wiring and tubing. · As options, users can order a hollow-shaft type or a tool flange option for simple tool installation.